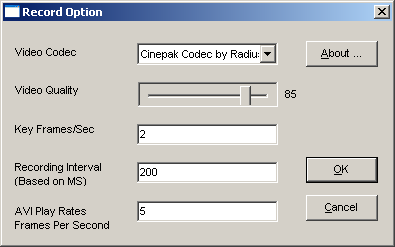 From this drop-down listbox, you may select a codec for encoding recording into AVI. Different codec may be fit for different purposes including better video quality, smaller file size, or higher compressing speed, etc. The number of available codecs listed here depend on what codecs are installed on your computer. This software 321Soft Screen Video Recorder does not bundle any video codecs because of possible copyright reasons. From this video quality slide bar, you may set the output video's quality. The number may be from 0 to 100, the larger is the value, the higher is the output video quality. Too high video quality number may cause you computer very slow or even crash, so this number could not be too high, the value depends on your computer's hardware quality. This means the key frames included in your video that should not be lost. If you are recording full screen, this value may be set to 1 or 2 according to your computer hardware's quality. If you are recording an area no larger than 320x240, then this value may be from 3 to 5 as you like. This means the interval between two frames recorded. And this value is used with the below AVI playback rates. If you want to recording 10 frames per second, then this value should be 1000/10 = 100 (MS).